Dr. Jeff Rockwell, DC is a chiropractor, body worker and somatic educator, with a passionate interest in the neuroscience of manual therapy. A pioneer in the use of instrumentation in neuromuscular therapy, Rockwell has been a popular teacher on the seminar circuit for the past twenty years. Professor of Clinical Sciences at Parker University for many years, he is the author and producer of numerous manuals, books, and DVDs on neuromuscular therapy and somatic education, and he is a member of the Continuing Education faculty for Parker University. Dr. Rockwell can be reached at www.manualneuroscience.com, touchinghealth@aol.com or 831-713-8885. KOCH (K): Jeff, I must tell you that I have been studying your DVDs and am very impressed with your work. The ease, with which you present your material and your knowledge of the details of the anatomy of the entire musculoskeletal sys- tem, makes it very easy and enjoyable to watch, understand and apply. ROCKWELL (R): Thanks, Bill, I love and live this stuff. I am always studying, learning, refining and changing what I do as new information and scientific data comes along. K: That is the essence of being a professional. It is the reason that we say that we are “in practice.” We are never a finished product. If we are not evolving, learning and improving, we are static, stagnant and intellectually dying. R: I totally agree. We are living in an incredible time. Infor- mation is coming at us so fast that it is challenging to keep up. It is very exciting! K: It certainly is. One of the things that I find so exciting, as well as rewarding, is that every new scientific finding validates our vitalistic philosophy. It is like a beautiful jigsaw puzzle that is taking shape. Science is finally able to give us the technical reasons for what we have instinctively known for decades. R: Yes, the great thing is that so much is applicable to our everyday care of our patients. It has allowed me to refine my technique by taking advantage of the latest research, especially in neuroscience. K: Very interesting, I have always said that chiropractic is not about bones and muscles; it is about the brain and nervous system. If it is not about that, it is a lot ado about nothing. Chiropractic is all about neurology, if you are doing it right. So please tell me about the neurological aspects of what you do because it looks like soft-tissue work. R: I know it does, but looks can be deceiving. It isn’t about soft tissue. It is all about the nervous system and the understanding of how and why it works the way it does. That has given us a whole new insight into how best to access it and work with it more effectively than ever before. K: Okay, you have my attention. So how does what appears to be treating soft tissue take on neurological implications? R: This really is exciting stuff because it brings together some of what we already know academically but positions it where it makes functional sense. Here is what I am talking about: When we were in chiropractic school, we studied embryology. We learned that the brain and nervous system developed from the ectoderm layer of germinal tissue. We also learned that the skin was also of ectodermal origin. Right? K: Absolutely, I always found that curious. What is the significance? R: The implications are huge, Bill. Neuroscience is making discoveries that are dramatically expanding our understand- ing of how the nervous system works and carries energy and information to every cell of the body. K: We have known for a long time that the nervous system experiences and records everything holographically throughout the entire body. Is this what you are talking about? R: Exactly! And I will talk about that in a minute, but I don’t want to get ahead of myself. Let’s talk about the skin. It is not an accident that it is ectodermal, like the nervous system. The skin is, in fact, an extension or an end organ of the brain. K: I see, just like the olfactory bulb, optic nerves and eyes are extensions of the brain stem. R: You got it. It is the same thing. Now, think about this: There are six yards of mechanoreceptors under every square inch of skin. K: That’s impressive. Talk about a tight network. No wonder the skin is so sensitive. R: You can think of the skin as the most accessible part of the nervous system. We know that the largest population of mechanoceptors lies just below the surface of the skin in the superficial fascia. K: I am glad you mentioned that. I found your discussion of the fascia particularly interesting when I was studying your instructional DVDs. I would really like to hear more about it. I will just tell you that when you spoke of the fascia as being a semiconductor with a crystalline nature, you really got my attention, because I know that it would not only make it capable of conducting energy, but also capable of generating a piezoelectric charge when subjected to deformation. R: Okay Bill, since you obviously understand the importance of this, let me take it further. I recently attended the Fascia Research Conference. It only meets every three years, each time in a different country. This time it was in Vancouver; the previous one was in Amsterdam. K: I’ve never even heard of this group. 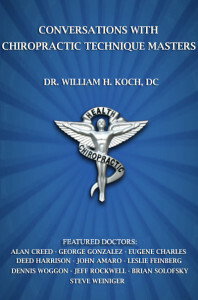 Were there many chiropractors there? R: No, chiropractic was not well represented. It’s really too bad because they presented some really great information that is very relevant to us. K: Great, tell me about it. R: I am going to give you a trail of breadcrumbs to follow. You are going to love this, Bill, because it explains so much. You will recall that in school when we learned about pro- prioceptors, the only ones they spoke about were the Pacinian, Ruffini and Meisner’s corpuscles. Later, we began hearing terms like mechanoreceptor and nociceptor, right? K: Sure, nociceptors being the ones registering pain and mechanoreceptors noting mechanical changes in tissues or joints. K: I see what you mean: like an indefinable thing that causes the hair on the back of your neck to stand up; that intuitive sense that is more quantum than triggered by one of the six senses. R: Right, something that you know but can’t quite put your finger on why or how you do [know]. Wild, isn’t it? R: I want to tell you more about the mechanoreceptors and, specifically, the nociceptors. Stimulation of the mechanoreceptors affects neuroplastic changes in the brain. Now here is the really interesting part. At the Fascia Research Conference, we learned that high velocity thrusts, as in the P-A thrust of the typical adjustment, affect the higher centers of the brain, causing neuroplastic changes that last only 20 seconds. However, very light tangential forces cause positive neuroplastic changes in the brain that last 20 minutes. K: So light forces create more positive, long-lasting changes in the brain than do heavier ones. That sure is counter-intuitive. R: The way it works is that the Ruffini corpuscles are slow to respond but continue to buzz and stimulate the brain for about 20 minutes, as opposed to the Pacinian corpuscles that only fire for 20 seconds. It is naturally easier to piggyback on 20 minutes than 20 seconds of brain imprinting. K: What you are saying is that the mechanoreceptors do not like strong compressive forces but are most responsive to tangential forces. Would that be as you show in your DVDs when you use the Therapy Edge™ attachment on a VibraCussor®? R: That is exactly what I am doing. That’s why Ed Miller at Impac, Inc. designed that attachment. K: I have a Therapy Edge™, but when I first got it, I was not crazy about it. That is because I didn’t understand how to use it. I started getting used to it only after watching how you use it. Now that I understand the neurophysiology behind it, I have to keep reminding myself to go lightly. It just requires a little retraining for an old full- contact chiropractor like me. R: I like to explain it this way, Bill, we have all learned to speak to the body in “mesoderm-ese.” That is, we have been used to working on muscle and skeletal structures, which come from the mesoderm layer of embryonic tissue. Now we find that in many instances, the body would rather be spoken to in “ectoderm-ese.” It’s like another language that the brain understands better and is more responsive to. It makes sense because the tissues we are working on are of ectodermal origin. K: This might be a silly comparison, but if you speak to a child in a soft voice, you will most likely get a better response than if you constantly yell at him. R: I don’t think it’s silly at all. I think it’s a good comparison. It is all about imprinting the brain. K: Jeff, what you are talking about is a new paradigm in neurology. R: It certainly is a new paradigm: A different understanding of how the nervous system works. Think about this. Nerves under pressure or tensile stress become hypoxic. Pain isn’t just reporting on that stress, it is a cry for movement to get the microcirculation of blood around the nerves going. K: I can’t argue with that logic. It is the nerves’ way of saying that they are starving and gasping for breath. R: This is why we all have a type of reflex behavior known as pandiculation. You know it as the urge to stretch and yawn. It is another way in which the body causes us to move instinctively. K: That makes sense. We see that in our pets. Dogs and cats stretch and yawn all the time. It is an instinctive activity that keeps these naturally active predatory animals strong and supple in a much more sedentary lifestyle than they would have in the wild. It is also why the practice of yoga is so beneficial to us. R: Speaking of blood flow, we all know that the cerebellum modulates muscular coordination, but we recently learned that it controls the distribution of blood to all of the organs of the body. K: Wow! That is huge. It explains why even a mild level of cerebellar ataxia is so devastating to the whole body. I have seen a number of cerebellar ataxias through the years and have had good results with them. I currently have two young women in my practice who have Fredrick’s ataxia, a genetic form that is only passed on if both parents have the gene. R: Bill, you obviously get all of this, so I am sure you will agree with another paradigm shift. It is for us to move away from being an operator to an inter-actor. An operator, in the way a surgeon operates on a patient, is purely allopathic. It is something that the patient submits to in faith. When we work with our patients as an inter-actor, it is a joint, cooperative effort. K: I agree with that. It is symbiotic and much better aligned to our vitalistic approach to healthcare. R: That’s it, Bill. I believe that it is the direction we need to go as a profession. K: There is no doubt in my mind that you are correct. It is the right message for our time. Healthcare as we have known it is changing as we speak. Now more than ever it is important for people to be proactive and informed in order not to be victimized by the medical industrial complex which is already rationing care based on cost effectiveness, not patient needs. Those of us who practice interactively with our patients will be well positioned to be the natural choice in healthcare for those who are sophisticated and smart enough to seek our services. R: Amen to that. We are on the same page. K: Thanks Jeff. I really enjoyed this conversation and certainly learned a lot.